Top o’the morning to you. And the rest of the day as well! We slipped away for a few days of RR week before last. Went to Las Vegas. Excuse me for whispering here, but I have to be careful since we didn’t tell many people we were coming. Not because we didn’t care to see old friends, but the main purpose of the trip was to kid-sit the grandchildren while their parents ran the half-marathon at Red Rock Canyon, one of favorite places in the Las Vegas area. We also snuck in dinner at our favorite Thai restaurant, Lotus of Siam. This is the only Thai place I’ve seen in this country that features both northern and southern Thai food. We made certain we ordered our favorite southern Thai dish–Larb, made with spicy fried tofu and spices (instead of the traditional meat) served with slices of raw cabbage. The cabbage does a good job of hedging the dragon’s-breath heat of the food. The Thai iced tea I ordered also helped cool things down. I’ve been looking for an excuse to post this picture of my very first Guiness (the 1/2 pint on the right) I drank in a pub in Dublin. I took to the dark beer even though I never cared for the light ones (you can pour most of them right back into the horse they came from in my opinion!). It has to be hot hot summer day to get me to drink one. I understand many first-time Guiness drinkers have to get used to the slightly bitter brew. Hope all of you with a drop or two or, what-the-heck, not even a drop of Irish blood find your own good time to raise your glass to honor that famous animal lover, St. Patrick. Hubby’s an avowed Irishman on this day every year. Just as his T-shirt says, “Kiss Me! I’m Irish.” And just in case you’re having trouble rounding up your friends to share a 1/2-pint or two, here’s an idea from YouTube. Sorry to have missed the friends in Las Vegas! If any of you happen to read this (now I’ll find out who keeps up with me), we’ll catch you next time. I hope to be back here soon with some of the finer digital scenes of Las Vegas I captured this time. This entry was posted in International Travel, musing, unapologetic foodie and tagged Dublin, Guinness, Saint Patrick's Day, Stout, Thai cuisine, Tofu by Alice. Bookmark the permalink. We’ve done “secret visits” also. It’s hard but sometimes we just don’t have enough time to see everyone we’d like to see. Tell today’s Irishman that Colleen says Hello! Happy St. Pat’s Day. I loved the roundup. Great fun. The Lotus of Siam looks interesting to me. Judy and I had a good time at an Asian place a little south of Lotus of Siam on Paradise Road, Saytay Asian Bistro and Bar, 3900 Paradise Road. Love Guinness when poured right from the tap so that it has a delicious creamy head. There is a six step ritual described in Esquire (http://www.esquire.com/the-side/guinness031207), Cheers and a Happy St. Patrick’s. PS That is a great video, an especially nice Boarder Collie. When I was very young I had a Border Collie/something else mix. One of the best dogs I ever had! She’d protect me at any cost. Even if someone raised his voice at me as a joke, she would emit a low growl. I have a soft spot for them. As for the six-step program for pouring Guiness, I’ll remember it next time I pour a glass myself. Alas, we have to buy the stuff in cans here. Sounds like you had a nice St. Pat’s! I’m not much for Guinness but I do tend to prefer dark beer! And I never drink Budweiser — it gives me a headache. I think you just gave away your name, Mage! 🙂 I knew quite a few in my day. Greetings from the (former) Irish household. Did you know that Irish is an English surname? Seems that years ago, a band of disgruntled Irishmen/women left the Emerald Isle and settled in a northern part of England where the natives referred to them as “the Irish.” I attended a lovely wedding on St. Patrick’s Day. The reception hall was decorated with shamrocks, and the cake had a minty green batter. The bridesmaids looked fabulous in their kelly green dresses, and the groomsmen were handsomely attired in matching green waistcoats. The bride wore glittery green shoes. Me? The best I could do was a royal blue suit adorned with a charming shamrock broach. Hey, my relatives sailed by Ireland 200 years ago but probably were too seasick to care. Two decades ago I stayed in Dublin for a month. My local guardian there, a kind elderly Irish lady, told mee her sister suffered from anaemia and the doctor had advised her to drink Guiness as it is a rich source of iron. After that I took the middle of the road approach, on the straight and narrow path to the nearest Irish pub every evening, staying clear of all magnets. “A very belated St Patrick’s Festival greeting to you and hubby. I was busy celebrating the good man in Dublin and since my arrival home have battled with a bug, hardly able to lift my head off the pillow. The secret in pouring the black stuff is to tilt the glass and let the liquid run slowly down the inside of the glass. When it is about half full, slowly bring the glass upright while continuing to pour and this allows the Head (foamy part) to form on top.Once the glass is full, allow it to sit for some time to settle. How do you know if the Guinness is good in a pub? Just look around and see how many of the clients are drinking it, If the answer is very few, then avoid it. Follow the locals – If they are drinking Guinness then go for it. Way back in 1958 my father was dying and spent almost a year in hospital. His recovery was very slow and he was off his food. 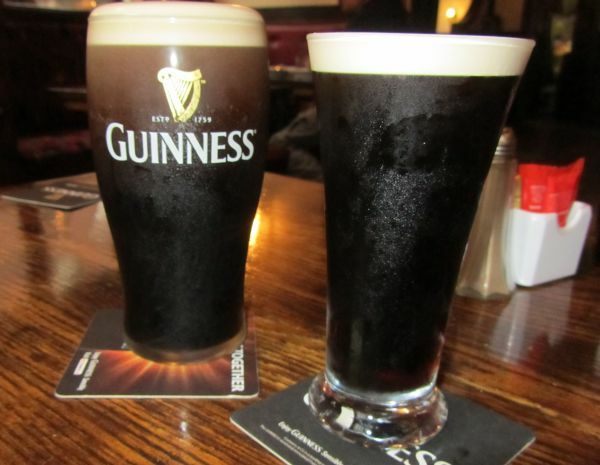 He was medically written up for a glass of Guinness mixed with 5fl ounces of cream every day. That soon got him on his feet again.